The WMRC’s first monthly model display of the season showcased three scratch built HO gauge MOW models by Aaron Woloshyn. He was awarded a $15 voucher from a local hobby shop. Aaron came up with the idea of building a CN tie exchanging gang earlier this year. 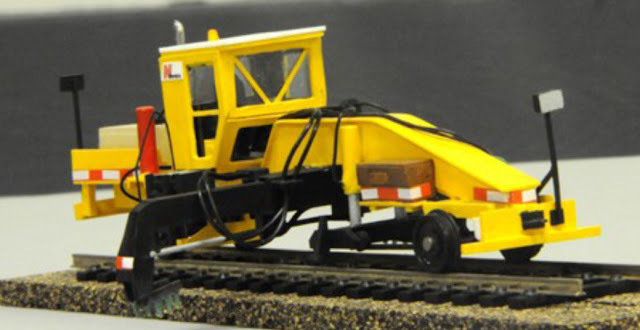 There are many ready made models and kits that are available but he couldn’t find any that worked for his Canadian railroad. So he decided to do what he liked to do and made his own machines. 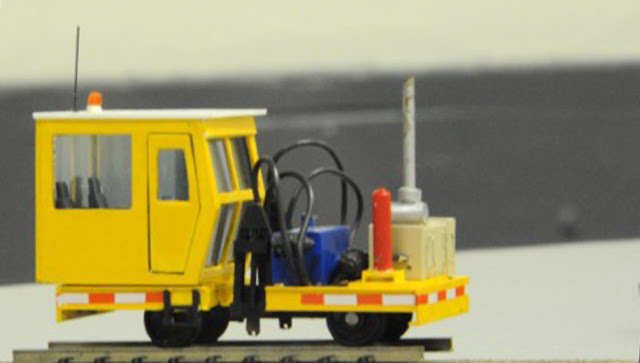 He printed photos of each machine in HO scale using dimensions from the Nordco website. Once this was done he used the photographs as a reference for both shape and size to build the entire body of each machine out of Styrene. Additional detail parts were used for each machine to add to the complexity. They are all hand painted and the ballast regulator has various decals from his collection. The rest will be getting decals soon, and they all will get a generous amount of weathering before they are considered finished. All photos by WMRC Lantern Editor Robert Weaver.